I tried for an update, buuuut it didn't work out. We'll do MWF next week and the week after instead. Sorry folks! I can at least use the weekend to (hopefully) get ahead. Y'know, I considered putting up a link to vote for the next page and then going "ha ha April Fools I haven't had a chance to draw it yet," but that's just mean. You can however vote because you're awesome people who appreciate not being tricked? How about April Fools! What it Takes has turned into an introspective, biographical diary of Colbey's feelings? Hmm you'd likely end up with the same story, this one just has less inner narrative swearing. Anywho. Colbey made her dad check dark places for monsters. Dark places like the under the bed. Where she is currently sleeping. I wonder what that means? 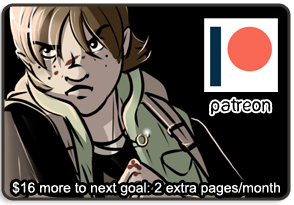 Thanks to a new patron (plz check your Patreon messages <3), we're outta the danger zone for the two extra updates each month. 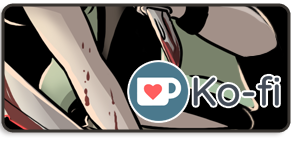 Are there other rewards you readers might like, that might entice you to support the comic? If the goal amounts have got you down, please remember the point of Patreon is to be paid for work you ALREADY do. So, my goal of $100 for two extra pages each month? That means I get paid about $10/page (10 updates/month). It DOESN'T mean I'm asking to get $50/page. But I'm banking all of this Patreon support to print the book in the future, so the more that is saved now, the less must be raised in the future! It's not legit until I get all the files ready for kickstarter (in a little less than a year), but Patrons will likely all receive free books with perks as long as they've supported up to the base price of the book. I'm ramblin' now and talking about faaaaar in the future. Come back Friday (the near future) for another page. PS--personal victory, my F30 got scored 5th percentile. CELEBRATION! If you don't know what this means, you're likely far cooler than I.